Significant change was likewise in the air at the United States Mint, where steam power made its debut that year. 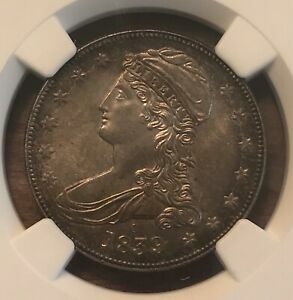 This technological innovation ushered in an era that would witness great improvement in the technical quality of U.S. coinage but, at the same time, a sharp reduction in individual coins' distinctiveness, the characteristic that many collectors find most appealing in the nation's earliest coins. In point of fact, the switch from lettered to reeded edges reflected not the capabilities of steam-powered coinage, but rather its limitations. Steam power enabled the Mint to produce coins more efficiently and with far greater uniformity, but these technical advances came at an aesthetic cost, including a severe limitation on edge ornamentation. With a steam press, each coin blank had to be held in a single-piece restraining metal collar (in effect, a third die)at the moment the obverse and reverse dies imparted their images. Lettered-edge coins, by contrast, were made in open collars; this permitted the planchets to spread out slightly when they were struck and thus kept the lettering intact. In close collars, the lettering would have been squashed by the high compression. From that point on, the edges of coins would have to be either plain or vertically reeded, and the quaint edge lettering of early U.S. coinage was consigned to history's scrap heap. Had it not been for economic and geographic factors, steam power might have gained a foothold at Uncle Sam's Mint decades sooner. U.S. Mint Directors had been interested in the technology ever since 1797, when Matthew Boulton demonstrated its value by coining more than 34 million pennies in this manner for the government of Britain's King George III. Those coins were more nearly identical (and thus more frustrating to would-be counterfeiters) than any similar quantity ever made previously by any other method. For various reasons, however, no foundry in the United States had the capability to build a steam coinage press until the mid-1830s. Up until 1836, U.S. coins were made on screw presses. Workmen and animals, rather than steam, provided the power. During the nation's very early years, oxen and horses played a role; thereafter, the power came from men alone. It took five men to operate a typical screw press:two on each end of a weighted iron bar and a fifth man seated in a recess in front of the press. The seated man would insert planchets and remove finished coins; meanwhile, his four co-workers would tug on leather straps attached to the iron bar. The bar, in turn, was attached to a heavy iron screw which drove an upper die down toward a lower one when the men on one side of the bar pulled it toward them. Then, when the men on the other side tugged on the bar, the screw and upper die were raised, and the seated man would remove the finished coin and insert a new planchet. Though primitive, this method was surprisingly productive: A good team of coiners could turn out several dozen small-size pieces per minute. 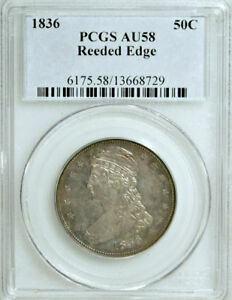 The first reeded-edge half dollars were very close in appearance to the Capped Bust halves that preceded them. The portraits of Liberty on the obverse and the eagle on the reverse were basically the same as those fashioned three decades earlier by engraver John Reich, but both sides also revealed subtle refinements by a new Mint engraver, Christian Gobrecht. 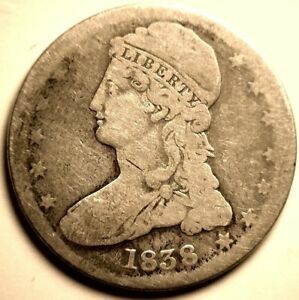 Among other things, the 13 stars on the obverse were reduced in size, Liberty was slenderized, E PLURIBUS UNUM was removed, and the statement of value was modified: Instead of saying 50 C. like its predecessor, the new coin read 50 CENTS in 1836 and 1837 and HALF DOL. thereafter. In 1838, Gobrecht made other changes, using larger and heavier lettering and tinkering with details like the eagle's talons and feathers. Strictly speaking, the reeded-edge half dollars dated 1836 are patterns, since the legislation authorizing this coinage didn't win passage until January 18, 1837. They're widely viewed as regular issues, though, since most of them were placed in circulation. 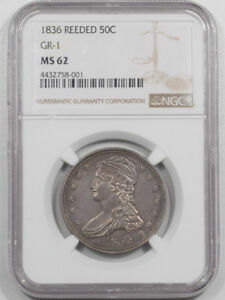 In 1838, the very first branch-mint half dollars came into being at New Orleans and promptly joined the roster of great U.S. rarities. Just 20 pieces, all proofs, were struck that first year; they carry an "O" mintmark above the date. These are the only proofs in this short series. New Orleans made halves again in 1839, this time in numbers approaching 179,000. Output at the main mint in Philadelphia was in the millions annually from 1837 through 1839. 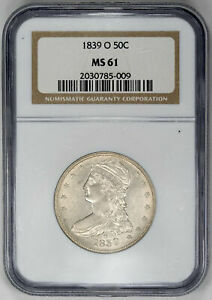 Capped Bust/Reeded Edge half dollars are readily available in mint state grades, but relatively few have survived in levels of MS-65 and above. Although generally collected in the higher grades as type coins, some date and variety specialists assemble sets in circulated condition, often as part of the larger Capped Bust series. Points to check for wear on the obverse include the drapery at the front of the bust, the shoulder clasp and the cap and hair above the eye. On the reverse, wear will first show on the eagle's wing-edges and talons. In 1839, Capped Bust halves gave way to Christian Gobrecht's Seated Liberty design, which enjoyed a run of more than half a century.